Oscar Wilde. Wilde, Oscar, photograph. There is a temptation to treat British author Oscar Wilde’s work lightly in large part due to his flamboyant and notorious lifestyle, which is often better known than his writings. He posed as an aesthete and a decadent—a follower of literary movements of the late Victorian age that argued for ‘‘art for art’s sake.’’ Nevertheless, Wilde advocated reform through social critique in his plays, short stories, novels, essays, and poems, and he challenged Victorian morality with his work and his lifestyle. Influenced by Creative, Flamboyant Mother. Wilde was born in Dublin, Ireland, in 1854. At the time, Ireland was part of the United Kingdom, and controlled by the British. Outside of the six counties of the north that were predominantly British and Protestant—commonly known as Ulster—absentee British landlords controlled much of the land in the remaining twenty-six counties that were predominantly Catholic, rural, and poor. There was long-standing tensions between the British and Irish, as the Irish agitated for more control and home rule. Wilde’s family was Anglo-Irish, and he was raised a Protestant. His father, Sir William Wilde, was a well-known surgeon. Wilde likely learned sympathy for the poor from his father, who would collect folklore instead of fees from the peasants he treated. Wilde’s mother, Jane, wrote popular poetry and prose under the pseudonym Speranza. She was a writer and poet with a flair for the dramatic not only in her writing but also in her appearance. She dressed up in increasingly outlandish costumes, complete with headdresses and bizarre jewelry. Wilde shared both her literary taste and fashion flamboyance. Jane Wilde created a salon society in Dublin, and her large Saturday-afternoon receptions included writers, government officials, professors, actors, and musicians. After her husband died in 1876, she moved her salon to London. Her poetry was inflammatory and pro-nationalist, and in 1849 during the sedition trial of a magazine editor, she stood up in court and claimed authorship of the offending articles (a mother taking responsibility for someone else’s failings to save their reputation is a theme in Wilde’s play, Lady Windemere’s Fan, 1892). She became famous for this incident and, many years later, encouraged Wilde to stand trial rather than run away, no doubt imagining another famous court victory for the Wilde family. In general, Wilde’s childhood appears to have been a happy if unconventional one. He had an older brother, Willie, and a younger sister, Isola, who died at the age of eight in 1867. The family was devastated by Isola’s death. Wilde, who regularly visited her grave, wrote the poem ‘‘Requiescat’’ (1881) in her memory. His father’s three illegitimate children, fathered before he married Jane, were also included in the family, and all of the children spent their holidays together. Early Literary Attention. For three years, Wilde was educated in the classics at Trinity College, Dublin, where he began to attract public attention through the eccentricity of his writing and lifestyle. At the age of twenty-three, Wilde entered Magdalen College, Oxford. In 1878, he was awarded the Newdigate Prize for his poem ‘‘Ravenna’’ (1878). He attracted a group of followers who became a personal cult, self-consciously effete and affected. His iconoclasm contradicted the Victorian era’s easy pieties (the Victorian era was marked by romantic, evangelical, and humanitarian impulses, but with moral, insular overtones), but this was one of his aims. Another was the glorification of youth. Wilde published his well-received Poems in 1881. He lectured in the United States and in England, and he applied unsuccessfully for a position as a school inspector. In 1884, he married Constance Lloyd, and their children were born in 1885 and in 1886. He encouraged his wife’s political activity, including her involvement in the women’s liberation and suffrage movements. Challenging Societal Norms. Wilde was also a reformer in support of women’s liberation. He took over the editorship of the Lady’s World: A Magazine of Fashion and Society in 1887 and reconstituted it. Discussion of fashion was relegated to the end of each issue, and serial fiction and articles on serious topics, such as the education of women, were moved to the front. Wilde also insisted the magazine be renamed the Woman’s World, because he regarded ‘‘lady’’ as a pejorative term. Wilde remained editor for two years, but his involvement lessened as his other writing activities increased. His first popular successes in prose were fairy tales: The Happy Prince, and Other Tales (1888) and The House of Pomegranates (1892). 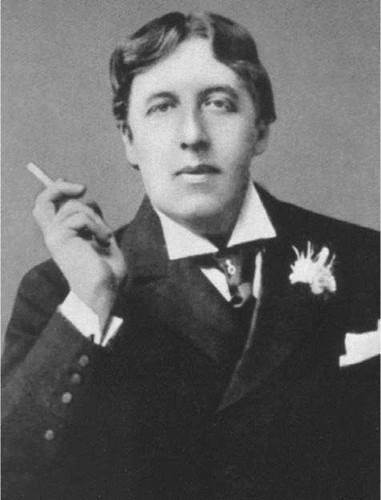 Wilde became a practicing homosexual in 1886. He believed that this subversion of the Victorian moral code was the impulse for his writing. Wilde considered himself a criminal who challenged society by creating scandal, and his works often explore the criminal mentality. ‘‘Lord Arthur Savile’s Crime,’’ from Lord Arthur Savile’s Crime, and Other Stories (1891), is a comic treatment of murder and its successful concealment. The original version of The Picture of Dorian Gray, published in Lippincott’s Magazine, emphasized the murder of the painter Basil Hallward by Dorian as the turning point in Dorian’s disintegration. Dramatic Success. Between 1892 and 1895 Wilde was an active dramatist, writing what he identified as ‘‘trivial comedies for serious people.’’ His plays were popular because their dialogue was clever and often epigrammatic, relying on puns and elaborate word games for their effects. Lady Windermere’s Fan was produced in 1892, A Woman of No Importance in 1893, and An Ideal Husband and The Importance of Being Earnest in 1895. The years 1889 to 1895 were prolific ones for Wilde, but during these years he led an increasingly double life that ended in his imprisonment in 1895. This secret life was also featured increasingly in his work, especially in the novella The Picture of Dorian Gray (1891). This novella’s themes were also an example of the aesthetic movement, of which Wilde was a part. This late nineteenth century European arts movement centered on the doctrine that art existed for the sake of its beauty alone. The movement began as a reaction to prevailing utilitarian social philosophies and to what was perceived as the ugliness and philistinism of the industrial age. Imprisonment. Prison transformed Wilde’s experience as radically as had his 1886 introduction to homosexuality. In a sense, he had prepared himself for prison and its transformation of his art. ‘‘De Profundis’’ is a moving letter to his former lover that Wilde wrote in prison and that was first published as a whole in 1905. His theme was that he was not unlike other men and was a scapegoat. ‘‘The Ballad of Reading Gaol’’ (1898) was written after his release. After his release from prison in May 1897, Wilde went to France. He attempted to write a play in his earlier witty style, but the effort failed. He died in Paris on November 30, 1900. Bram Stoker (1847-1912): This Irishman was a theater manager and agent for twenty-seven years, but his parttime career as a fiction writer brought him immortality as the author of Dracula (1897). Paul Gauguin (1848-1903): This French postimpressionist painter spent most of his life in Tahiti and the South Pacific, creating highly original and influential paintings of scenes and people there. His paintings include Where Do We Come From? What Are We? Where Are We Going? George Eastman (1854-1932): This American inventor founded the Eastman Kodak Company and helped bring photography into the mainstream. George Bernard Shaw (1856-1950): This British writer and playwright wrote more than seventy plays during his career, including Pygmalion (1916, later adapted as the musical My Fair Lady). Emilia Pardo Bazan (1852-1921): This Spanish novelist described the degeneration of aristocratic families in novels like Los Pazos de Ulloa (1886). Wilde’s early education generated an admiration for John Keats, Percy Shelley, Benjamin Disraeli, and Honore de Balzac. In college, he was influenced by the writings of Walter Pater, who in his Studies in the History of the Renaissance (1873) urged indulgence of the senses, a search for sustained intensity of experience, and stylistic perfectionism in art. Wilde adopted this as a way of life, cultivating an extravagant persona that was burlesqued in the popular press and music-hall entertainments, copied by other youthful rebels, and indulged by the literary and artistic circles of London where Wilde was renowned for his intelligence, wit, and charm. Reaction to Victorian Values. The Importance of Being Earnest, Wilde’s last and most brilliant play, is a hysterical comedy but also a serious critique of Victorian society. Wilde anticipated modern writers such as Samuel Beckett in his use of farce to comment upon serious issues. The Victorian upper classes are presented as enclosed characters more intent on social surface in a world where form replaces emotion. Victorian stuffiness and hypocrisy in marriage, education, and religion are all critiqued, but always through the sparkle of Wilde’s biting satirical wit. Readers familiar only with Wilde’s plays and conversation may be surprised by his poetry, which demonstrates an expertise in classical literature and the mainstream Victorian influences of Matthew Arnold, Dante Rossetti, and Alfred Lord Tennyson. In Poems (1881), Wilde experimented with form and touched on many of the themes he would develop in his later works as a social and cultural reformer. He commented on what he regarded as the decline of civilization from the ancient Greeks to modern-day Europe. Decline became a recurrent theme in Wilde’s later poetry, which he used to attack Victorian ruling-class values. He refused to see the Victorian age as one of glory, writing instead about the seedy, usually unmentioned side of Victorian life. Aestheticism. Wilde saw art as a vehicle for moral and social reform; what was not beautiful was not good, including poverty. The idea of poverty as dehumanizing ran counter to accepted middle-class views, both secular and religious, for by implication the ruling classes were responsible for this oppression. The value of domesticity, pride in industrialization, and the ennobling quality of poverty were popular Victorian literary themes. In his lectures and essays, Wilde preached a new program of social reform through art and beautification projects. Wilde criticized the false glamour of Victorian upper-class society, but Wilde was also attracted to that world. He viewed Victorian ideals of art, reflected in the ornate and orderly decor of upper- and middle-class homes, as a sham. During his aesthetic phase, he set about to reform rigid notions of art and decorated his home and his person as exhibits of this new modern art. Wilde’s critical essays and dialogues in Intentions (1891) defined his artistic philosophy. For example, ‘‘The Critic as Artist’’ developed his deeply held belief that originality of form is the only enduring quality in a work of art, a quality transcending its age. ‘‘The Decay of Lying’’ insisted on the superiority of art to nature and put forth the paradox that ‘‘nature imitates art,’’ using this thesis to work out an ingenious line of argument revealing insights into the relationship between the natural and aesthetic worlds. ‘‘Pen, Pencil, and Poison’’ examined the relationship between art and morality, concluding that in fact there is none. Influence. Wilde has remained one of the most admired, read, and performed writers of all time. His poetry, essays, and children’s books are reprinted regularly. The Importance of Being Earnest remains his best- known stage play, and is regularly performed all over the globe. Wilde’s influence can be seen in a number of authors’s writings, including E. M. Forester (who explores homosexuality in his novel Maurice) and, more recently, Stephen Frye, an actor/novelist/amateur Wilde scholar. Wilde was a famous conversationalist. His sharp, witty observations seemed to come out of his mouth perfectly formed, precisely balanced, and always apt. Legend has it that Wilde's dying words were ''Either that wallpaper goes, or I do.'' The following works celebrate the art of witty conversation. The Life of Johnson (1750), a biography by James Boswell. Samuel Johnson was a leading author and critic in the eighteenth century, and much of his considerable literary authority came from the forcefulness and genius of his conversation. Boswell recorded a great deal of it, real or reconstructed, in what became the first great biographical study. Annie Hall (1977), a film written and directed by Woody Allen. This film established the comic pattern that Allen would follow in many of his later comedies: an effete, clumsy intellectual encounters beautiful women and his own insecurities, and the result is a long string of witty exchanges and sharp, self-deprecating one-liners. The Bonfire of the Vanities (1987), a novel by Tom Wolfe. Wolfe is a conservative dandy, usually decked out in a white suit, florid tie, and spats, playing the role of bemused and devastatingly witty social critic. This bestselling novel is set in New York and takes an ironic look at American culture of the 1980s. A True Relation of My Birth, Breeding, and Life (1656), a memoir by Margaret Cavendish. In an era when intellectual pursuits were reserved only for men, Cavendish was a poet, philosopher, playwright, and author of one of the earliest science fiction novels. In her autobiography, she describes herself as extremely shy, but in public she made a space for a new kind of brave female writer through her eccentricity and extravagant dress. Wilde’s lasting literary fame resides primarily in his plays, one of which—The Importance of Being Earnest—is a classic of comic theater. His only novel, The Picture of Dorian Gray (1891), while artistically flawed, gained him much of his notoriety during his life time. This book gives a particularly 1890s perspective on the timeless theme of sin and punishment. Upon his release from prison, however, Wilde was generally either derided or ignored by literary and social circles. At the time of his death in 1900, the scandal associated with Wilde led most commentators to discuss him disrespectfully, if at all. While critical response no longer focuses so persistently on questions of morality, Wilde’s life and personality still attract fascination. Biographical studies and biographically oriented criticism continue to dominate Wilde scholarship. After his death came a renewed critical interest in him, but it is only within the last thirty years that his work has received serious scholarly attention. Poetry. The general critical reaction to Wilde’s poems at the time of their publication was condemning and dismissive. Most reviewers were eager to denounce Wilde on the grounds of imitation of various writers and on his ornate language. The audacity of Wilde, an unknown in the literary world, perhaps triggered the critical attack when he published a collection of poetry. But in spite of the generally hostile reaction, within a year, five editions of Wilde’s Poems had been sold. 1. Identify and summarize melodramatic scenes from The Picture of Dorian Gray. What is their thematic purpose, if any? Put your answer in the form of a presentation. 2. What are ‘‘aphorisms’’ and ‘‘epigrams’’? Locate some of Wilde’s most famous examples. Can Wilde’s conversation rightly be seen as part of his lasting artistic achievement? Do the characters in his plays speak in much the same way? Write an essay with your conclusions. 3. Read ‘‘The Ballad of Reading Gaol’’ and/or ‘‘De Profundis,’’ and research the events in Wilde’s life that led up to it for a paper. Are you convinced by Wilde’s account of his motives and actions? 4. In a small group, look over the broad scope of Wilde’s life and work. Discuss such questions as: Could you say that one phrase that sums up most of it could be ‘‘the importance of being earnest’’? Why or why not? Bird, Alan. ‘‘An Ideal Husband.’’ In The Plays of Oscar Wilde. London: Vision Press, 1977. Foldy, Michael S. Feasting with Panthers: Social and Cultural Dimensions of the Wilde Trials. New Haven, Conn.: Yale University Press, 1997. Horan, Patrick M. The Importance of Being Paradoxical: Maternal Presence in the Works of Oscar Wilde. Madison, N.J.: Fairleigh Dickinson University Press, 1997. Howells, William Dean. ‘‘William Dean Howells on An Ideal Husband.'' In Oscar Wilde: The Critical Heritage. Edited by Karl Beckson. New York: Barnes & Noble, 1970. James, Henry. ‘‘Henry James’ Letter to William James on the ‘Triumphant Oscar.’’’ In Oscar Wilde: The Critical Heritage. Edited by Karl Beckson. New York: Barnes & Noble, 1970. Miller, Robert Keith. Oscar Wilde. New York: Ungar, 1982. Morley, Sheridan. Oscar Wilde. New York: Holt, Rinehart and Winston, 1976. Nassaar, Christopher S. Into the Demon Universe: A Literary Exploration of Oscar Wilde. New Haven, Conn.: Yale University Press, 1974. O'Connor, Sean. Straight Acting: Popular Gay Drama from Wilde to Rattigan. Washington, D.C.: Cassell, 1997. Raby, Peter, ed. The Cambridge Companion to Oscar Wilde. Cambridge: Cambridge University Press, 1997. San Juan, Epifanio. The Art of Oscar Wilde. Princeton, N.J.: Princeton University Press, 1967. Shewan, Rodney. Oscar Wilde: Art and Egotism. New York: Barnes & Noble, 1977. Worth, Katharine. Oscar Wilde. New York: Grove, 1984. The Official Web Site of Oscar Wilde. Retrieved April 28, 2008, from http://www.cmgworldwide.com/historic/wilde.